Posted by colbrarj on Wednesday, February 6, 2019 in Uncategorized. Hassane Mchaourab, Professor of Molecular Physiology & Biophysics, will be awarded the Silver Medal in Biology/Medicine from the ESR Society later this year for significant contributions in the applications, developments, and/or improvements to EPR/ESR spectroscopy. 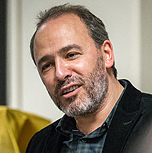 Mchaourab will be presented with the award at the 2019 EUROMAR/ISMAR joint conference in Berlin in August, where he will be a plenary speaker.